For more information on submitting a project to be considered for an Analytics Capstone Project contact the program director. For questions or more information on submitting a project to be considered for an MS SCE Capstone Project, please contact Tim Brown. The summer (May-July) term* of the M.S. 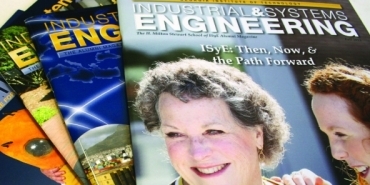 in Supply Chain Engineering program is dedicated to the Capstone Project in which students identify and define a supply chain design and/or analysis problem to be addressed with quantitative modeling. Projects are conducted with sponsors from business, government, or non-government organizations. Students apply their knowledge and skills to the project, and deliver valuable solutions to their sponsoring organizations. Students can complete the Capstone requirement either as an individual (typically a paid internship) working on an approved project, or within a small group of students (typically 2-4). 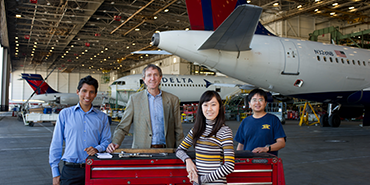 In either case, each project will be advised by a member of Georgia Tech's supply chain engineering faculty. During the Spring* semester, students and faculty work together to identify partners and projects prior to beginning the work. The Capstone project is completed in two phases. A short proposal phase is used to scope the project and define deliverables, which is followed by a work phase. Students report on their projects and results in oral presentations and written reports. Final oral presentations are grouped together on Capstone Project Day, where the whole class gets to hear about all of the interesting work conducted by their cohort classmates. *Most students complete their Capstone Project during the summer term while enrolled half time. Others choose to delay the Capstone until the following fall term, and use the summer to instead conduct a full-time internship or to travel. A sponsoring organization is expected to provide limited operational support for the project team. Usually, an advisor or mentor from the sponsor will help guide and review the work, and help in acquiring necessary data. During the project, each team may conduct both on-site work at the sponsor and on-campus work. Data provided by the sponsor may in some cases be sensitive. In these cases, Georgia Tech can enter into standard non-disclosure agreements that cover the project work. 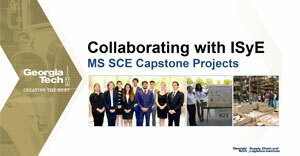 Since the Capstone Project is part of the MS SCE curriculum, team work will need to be assessed by faculty members, so written and oral presentation of the results is necessary. Project results are generally not published. There is no specific donation amount required for Capstone Projects. Upon satisfactory completion of a Capstone Project, a donation of $10,000 would qualify a company to be designated as a GT Supply Chain Innovation Network Member – with the associated benefits. Download instructions for making a donation. 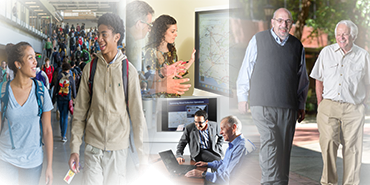 Sponsoring organizations can expect to benefit from a fresh perspective provided by our students, and will receive a systematic quantitative analysis of a supply chain problem along with creative yet realistic solutions. We hope you will find the experience of working with us invaluable. 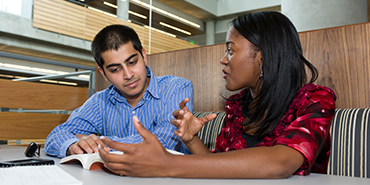 Students in the program are required to find approved Capstone Projects by early April each year. Once approved by Georgia Tech, the Capstone Project team begins project work in mid-May, and concludes project work by the end of July. Each student is expected to spend a minimum of 200 productive hours on the project, including time spent preparing a formal work proposal, collecting data and building analytical models, conducting analysis and interpreting results, and preparing a final project report. Students will also deliver proposals and final reports in oral presentations to the faculty and sponsors.